A standard feature of all Celsior products is Davey’s patented ‘heat maintenance technology’ that through the unique water jacket motor design, captures wasted motor heat and transfers it back into the water, keeping your bath water warmer for longer.The range includes standard heat maintenance as well as heat boost models, containing a heater element. Heat boost models are ideal for colder areas, where your spa bath water, may get cold very quickly. 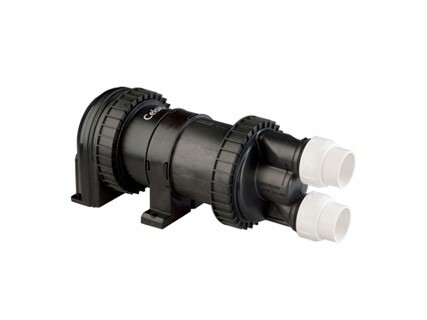 Easy to Install Celsior® Flexibrax makes installing a spa bath pump quick and easy. The Flexibrax flexible mounting device means the pump can now be installed directly onto a wall without the need for costly metal mounting brackets. IP56 protective enclosures also make Celsior® the ideal choice for outdoor installations, and reduces the need for costly covers. Free Heat Celsior® heat recovery technology maintains the temperature of the bath for longer by utilising waste energy which is otherwise lost when using traditional style spa pumps. Whisper Quiet 50% quieter than older style pumps to provide a more enjoyable spa experience.